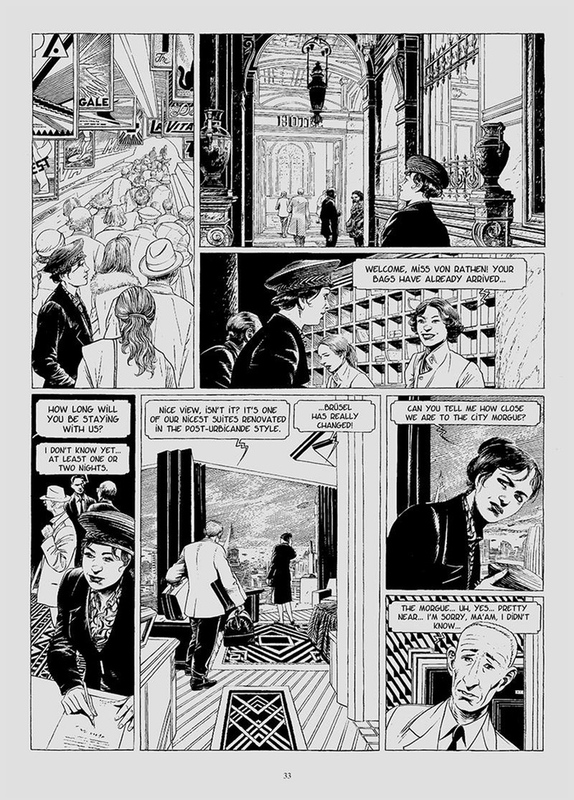 The albums of Schuiten and Peeters have been translated in English. 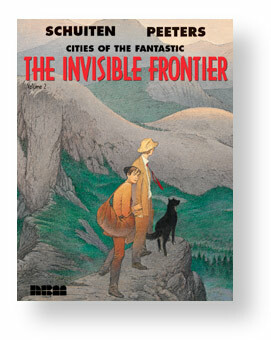 First as the Cities of the Fantastic by NBM Publishers. In 2013 Stephen Smith used Kickstarter to get an English translation of L'Enfant Penchée published. The album was published in 2014 by Alaxis Press. The series name changed to the more accurate The Obscure Cities. In January 2016 Steve Smith announced that IDW Publishing will take over the publication of the series under the Alaxis Press imprint. The invisible frontier volume 2 - 2004 AD - Hard cover. Translated by Joe Johnson. In the first quarter of 2014 Alaxis Press began the publication of the Les Cités Obscures series in English. As a longtime fan of the series, publisher Stephen Smith personally translated the first release The Leaning Girl. Alaxis Press was committed to complete the series in English beginning with the titles not already published in English by NBM publishers. Alaxis Press was also committed to share many of the rare Obscure Cities volumes, from the very rare pamphlet Correspondences of Mary Von Rathen to the book/DVD title, The Desombres Affair. But the publication of The Leaning Girl was harder than expected. Steve Smith used Kickstarter to fund the project. 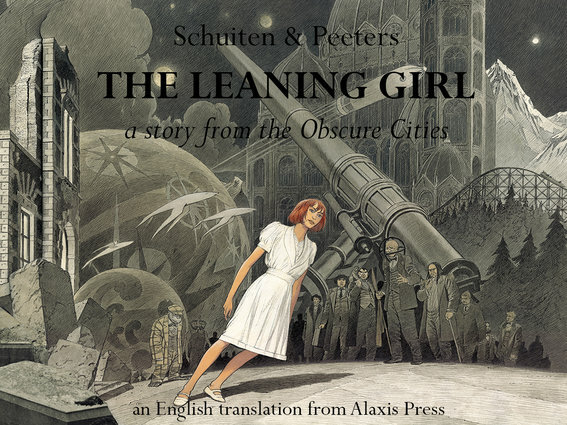 The launch of the Kickstarter campaign to fund the production of the first English language book in Alaxis Press' new Obscure Cities series, The Leaning Girl, was end of May 2013. The campaign ran for 45 days. In addition to the obvious (softcover and limited edition hardcover editions of the book), there were some surprise premiums for the different investment levels, beginning at just $1.00 and going up to $15,000. The Kickstarter campaign was launched to boost initial interest in the series from a larger audience not necessarily familiar with the content but very familiar with supporting art publishing. The production of the album took considerable time and distribution via comic shops were not a huge success. But in March 2015 Smith announced that the second translation: The Theory of the grain of sand would also have its Kickstarter project. This project was postponed due to the translation efforts of Smith for 12 La Douce 1). Casterman published this English release for the opening of Train World in Brussels in September 2015. The English title of this album is “The Beautiful”. In January 2016 Steve Smith announced that beginning with The Theory of the Grain of Sand, The Obscure Cities series will be published by IDW under the Alaxis Press imprint. “This move to IDW will enhance the impact this series can have on the English-speaking literary world because IDW has the marketing and sales skills that I lacked on The Leaning Girl. I will continue on as the editor and sometime translator of the series”, according to Smith. 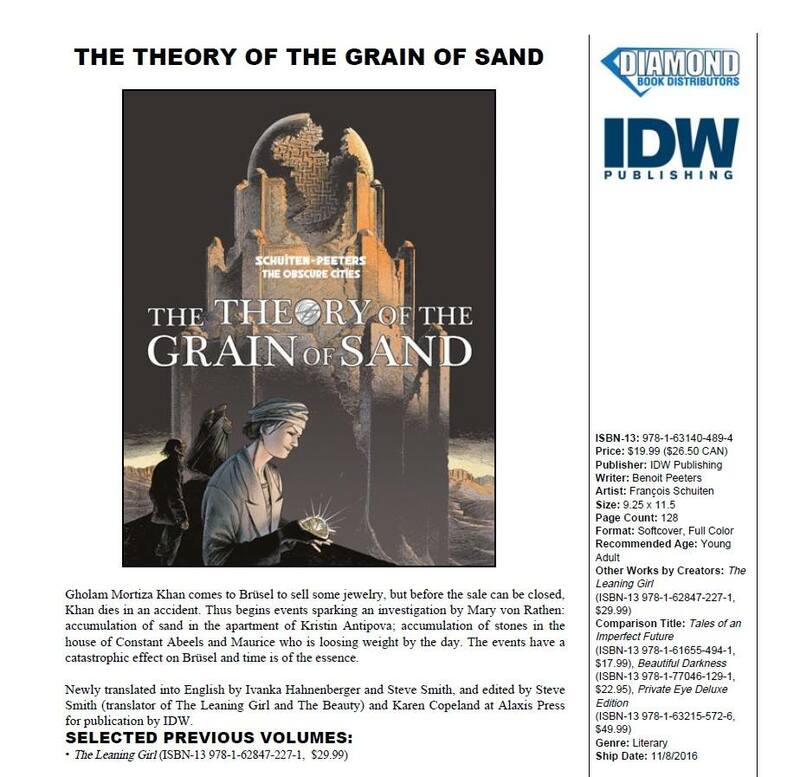 Starting with The Theory of the Grain of Sand, IDW Publishers will take over the publication of the Obscure Cities series. IDW Publishing is regularly recognized as one of the top four comic book publishers in the US. Over 80 IDW titles have appeared on The New York Times Best Sellers list. In FY2015 alone, IDW published over 500 unique comic book titles and over 250 graphic novels. IDW will keep using Alaxis Press as the imprint. Steve Smith will stay the editor of the series. The Theory of the Grain of Sand was published in November 2016 as a paperback version. Newly translated bt Ivanka Hahnenberger and Steve Smith. Edited by Steve Smith and Karen Copeland. Steve Smith said in January 2016: “Look for The Theory of the Grain of Sand in late summer and more news about future releases coming soon. For those of you who love the signed limited edition hardcovers, we are still working out the details but we will have deluxe editions of the books.”. In the end only a paperback version was published. Another disappointment for the publishing team is that in the book on page 33, there is one word balloon where the type somehow dropped out very late in our approval process. Below the correct page. The next publication was a special 30th anniversary edition of Samaris, collecting the original The Great Walls of Samaris book. 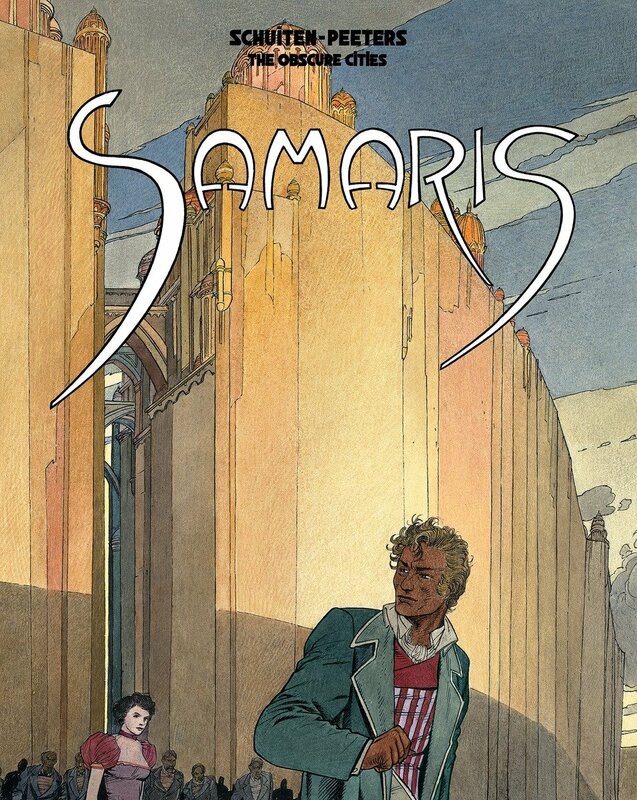 Samaris is the first volume of the chronicles of The Obscure Cities, published as a graphic novel in 1983 in French and published for the first time in English in 1987 as The Great Walls of Samaris. This edition, marking the 30th anniversary of the original English language publication, features an expanded main story, an all-new creator-approved translation, and new coloring. The book also contains the never before published-in-English “The Mysteries of Pȃhry,” a The Obscure Cities story, originally published in four parts, three in the French comics magazine, A Suivre, from 1987 through 1989, and in the December 1994 issue of Macadam-plus. The Samaris story is completely retranslated by Ivanka Hahnenberger, Steve Smith and Benoît Peeters, ensuring the most accurate interpretation 3).